For the best roofers in Avondale, contact the professionals at Arizona Roof Rescue. With an A+ rating with the Better Business Bureau and five star reviews on Home Advisor and Yelp, you can trust our roofing contractors in Avondale repair or replace your roof with quality and expertise. Serving all areas in Avondale, including the 85392 and 85323 areas, finding trustworthy roofing experts in your area is easy with Arizona Roof Rescue. 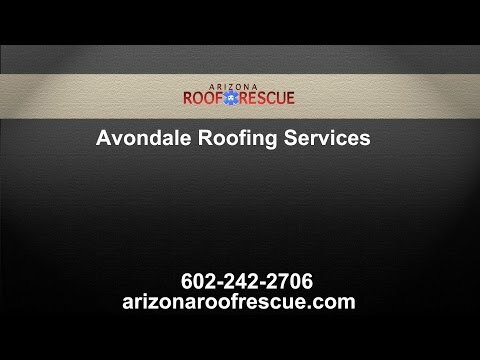 Arizona Roof Rescue is a full service Avondale roof repair company that can supply you with the best service and care that you need. One of the biggest issues with Avondale Arizona rooftop repair is that often times, minor problems are fixed while the main problem is left untouched. We refuse to leave you with a roof that continues to get damaged. Our mentality is that we’d rather replace your roof altogether! We are licensed, bonded, insured, NATE certified, and as such, we can expedite claims, it’s all in proof and you can feel confident in our aid. When you need a local roofing company near you in Avondale, trust the professionals at Arizona Roof Rescue to get the job done right. Serving the areas of Avondale in the 85353, 85329, and 85338, Arizona Roof Rescue can provide excellent roof repairs for your home in Avondale. For excellent roofing contractors who serve the 85339 and 85340 areas of Avondale, getting quality roofing services is easy with Arizona Roof Rescue. Trust our certified, bonded, and insured contractors to repair or replace your shingle, tile, or metal roof in Avondale. Don’t let a small problem become a major issue simply because you want to avoid dangerous prices. Poor insulation is the worst, and instead of spending your money on your air conditioning bill, you could be spending it on your roof instead! Your safety and well being can totally depend upon the roofing above your head, and that means everything to us! Come talk to our Avondale roofing company about affordable pricing and explore just what we specialize in to help you with your rooftop reliability. Call us at Arizona Roof Rescue to get a free estimate on your roof replacement. You will be shocked at how affordable we can be! Greetings Avondale, we are Arizona Roof Rescue. We notice that you have come very far in your development. We notice that you have a growth in residential as well as business investments, and we would like to assist you in the safety of your rooftops. We recognize the story of many citizens of Avondale; you are usually from another part of the country and have just moved to the Phoenix Valley for new business opportunity’s. Or, perhaps you are looking to complete your Bachelor’s degree at the west campus of Arizona State University. Another situation is that you are from the valley, but you have just become a homeowner. In any case, you are unaware of the pitfalls of property issues in the valley. A winter goes by, things seem fairly consistent, spring rolls on through with minimal rain and beautiful weather, everything is going along splendidly. Then, all of a sudden, you just experienced the most intense thunderstorm of your new life, and now shingles are falling off of your roof like leaves in the autumn. A week later, it’s really hot, no matter how low you turn down the air conditioning, and you are finding mosquitos, beatles, and perhaps even scorpions in your house; you aren’t sure what is going on! Headquartered On The Avondale Glendale Boarder!